Home news Buhari: How can someone sleep soundly owing workers’ salaries for months? Buhari: How can someone sleep soundly owing workers’ salaries for months? 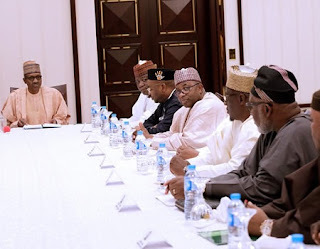 He showed his displeasure, on Tuesday, while receiving some governors led by the chairman of the Nigerian Governors’ Forum and Zamfara State governor, Abdul’Aziz Abubakar Yari, at the Presidential villa, Abuja. He said the plight of workers in the states needed urgent attention as many could barely survive. “How can anyone go to bed and sleep soundly when workers have not been paid their salaries for months? “I actually wonder how the workers feed their families, pay their rents and even pay school fees for their children,” he said. The president pointed out that two out of the three-pronged focus of the All Progressives Congress (APC) to secure the country and fight corruption had received some commendable reviews by the people, noting that the challenge in payment of salaries in states had taken a toll on the people. President Buhari said the Federal Government and state executives would need to work closer together to ameliorate the situation of workers across the country. He said he had instructed all government agencies to comply with the Treasury Single Account (TSA), in order to ensure more transparency and prudence in accounting for the revenues of the government and the sharing of entitlements with states. In his remark, Yari said the various interventions by the Federal Government, which included bailout funds, were judiciously utilised by the states, stressing that the governors inherited backlog of salaries and huge debts portfolios on assumption of office. “We are concerned with the situation in our states and we are trying our best to manage the resources,” he said. Yari noted that the bailout funds and part of the fallout from the London-Paris Club that had been received by the states were properly expended to alleviate the plight of workers, but more had to be done. The NGF chairman commended the efforts of the president in improving the economy, assuring that the states would continue working with the Federal Government to improve the livelihood of workers and all Nigerians. Governors of Ondo, Bauchi, Jigawa, Kwara, Akwa Ibom states and the deputy governor of Ebonyi State were part of the visit to the president. Speaking to State House corespondents after the meeting, Governor Yari said the governors thanked the president for approving the release of Paris Club refund and demanded the release of its balance of 50 per cent so that states could include it in their 2018 budget. He said: “We are here on behalf of the 36 governors and this is a result of the collective decision to see the president after the National Economic Council meeting last month. “Our mission here is simple; we are here to thank the president for his concern about the state of the economy and for giving us several supports, ranging from bailout, restructuring our debts to Paris Club exit payment.